Continue on to read some excerpts of the article. It's something Sean Wilson, the game's executive producer and a veteran of EA Sports' old NASCAR series almost a decade ago, called out to me earlier in the day. The previous editions of NASCAR-licensed games, developed by Eutechnyx, had drivers racing on rails and accelerating or braking within them. "This is a very racy AI," Wilson said, mentioning that the EA Sports games had three AI lines that all drivers adhered to. NASCAR Heat Evolution has none. Drivers should drive where they would in that situation in a real race. "You just always knew where they're going to be," in earlier series, Wilson said. "We really wanted a race at Talladega, in our game, to pack up like in real life." Challenges will pull out events from real-life races and ask the user to recreate them (typically requiring an overall race victory). They're gated by "speed points," which a user acquires according to their finishes in events in all modes of the game. The idea also is that NASCAR Heat Evolution's challenges can be updated as a racing season progresses. The career mode involves all but three events on the real-life NASCAR schedule, all run under their real-world sponsorships. The exclusions are the Daytona Can-Am Duels that qualify for the Daytona 500, and the series' All-Star Race, because of their variable rules formats. The season concludes with the Chase for the Cup playoff to determine a champion, as in real life. Drivers will acquire sponsors (real-world ones, too, thanks to NASCAR's all-in licensing of the game) who set performance goals and pay out accordingly. That money gets pumped into racing shop upgrades through a skill tree that has four branches (garage, engine, machining, fabrication). Wilson said it is possible, but it will be very difficult to make the Chase for the Cup playoff in a player's first year, meaning that maxing out that tree should take multiple seasons and fulfilling a lot of sponsor goals. There's a Season mode which is similar to career, except a player may pick his or her favorite driver and use them, and their car, over the course of one year. The season (and the seasons in a career) can be set to 6, 12, 23 or full length schedules, or skip directly to a Chase playoff. 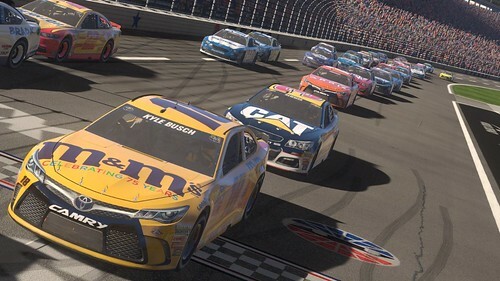 Races can run at 2, 3, 7, 13, 25, half or all of their real-life distance, giving players the option of eight laps in the Coca-Cola 600 or the whole shebang, in real time. In all of these modes, a driver acquires a track rating that ranges from 80 to 105. This governs opposing racers' AI (not necessarily their tendencies, but their effectiveness.) The idea, Wilson told me, is that a first run through, say, Pocono Raceway, will be very easy, with subsequent visits more challenging. Of particular note is the fact that alcohol sponsors, long verboten in racing games because the ESRB dings what needs to be a pristine E-for-Everyone rating, can be brought in through free, age-gated DLC. In the past, these bowdlerized sponsorships could look ridiculous, but for a gamer 21 or older, Keselowski's No. 2 Ford will have Miller Lite on the hood.